We were very pleased to help Sally become the proud owner of a S-Cargo which Martin had for sale. Sally sent in the pic below with the message "Just to show you Brian with his new sign-writing!" 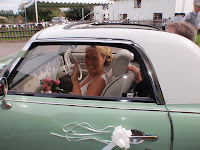 Back in July, Figgy-owning Clare decided she didn’t want a horse & trap, nor a Rolls Royce for her big day. Instead, she wanted to see if her Lapis Grey could find some friends to share in the fun & help take Bridesmaids and VIP’s to their Guildhall Wedding in Leicester. A call was put out to David (Mr Fig08), and thanks to the wonders of the Figaro Register, another Lapis & two Emerald Greens were rapidly volunteered by their owners, Pam, Shelley & Mike, for a most unusual Figaro Meet ! Some extensive and thorough emails followed to sort out the logistics….never mind the table layouts or how to prevent the Groom from being naked and 200 miles away, hard questions were being asked…..should the drivers wear fascinators or not (Mike decided no, but did briefly consider a Captains hat in lieu of the traditional chauffeurs cap), would the minor detail of some gearbox mountings and an MOT before the day cause any grief, how would we keep the convoy together en route…..but no, The Professionals were on the case. No pressure, but less than 24 hours before, Clare realised she might want a spare driver for her Figgy on account of her being driven, but Mike knew just the person, and his pal Martin agreed to drop family appointments for the afternoon and join in the fun! The next morning, Pam arrived first at Mike’s house to start on the ribbons to pretty the already beautiful vehicles for their Big Moments…….a minor disaster when it appeared we were a little short on the lovely green ribbon, but a rapid decision and kindly local florist meant there was no need to worry. Shelley arrived and pretty soon we had a convoy of 3 heading across to Kirby Muxloe. Bang on time, the trio-of-Figs arrived at Clare’s house, where the pre-wedding party appeared to be warming up nicely. A quick flannel and Clare’s Fig was ready for Martin to take the wheel. A tractor arrived to ferry the other guests to where the Big Red Double Decker was parked, and the Four Figs made their way up behind, with neighbours all waving at the spectacular convoy. With the guests safely on the Routemaster, the Figs followed behind, drawing much attention and smiles all the way into town. On cue, the barriers to the High Street were lowered by Traffic Control to let the little Fig’s pass round the block just in time for Clare to head in to the more important duties of the day. The Figs all went off to the White Horse for a pat on the roof and light refreshment, before heading their separate ways home, happy in the knowledge of a job well done ! We have since received a letter from the Hospital thanking all the Figaro Owners who helped raise this amount. Well done. There is a Fig10 Show report in the current September/October issue of Total Nissan which is now available at WH Smith. This was a nice surprise as we sent the report in just after the show but to late for their previous issue. The show was also covered in the August Issue of Classic & Sports Car which was a great scoop as they covered the Figaro Launch but nothing else until now. We also had a whole page in the September magazine of the Sporting Bears Motor Club. The SBMC use their Classic and Sports cars to raise money for Children's Charities and we are members. 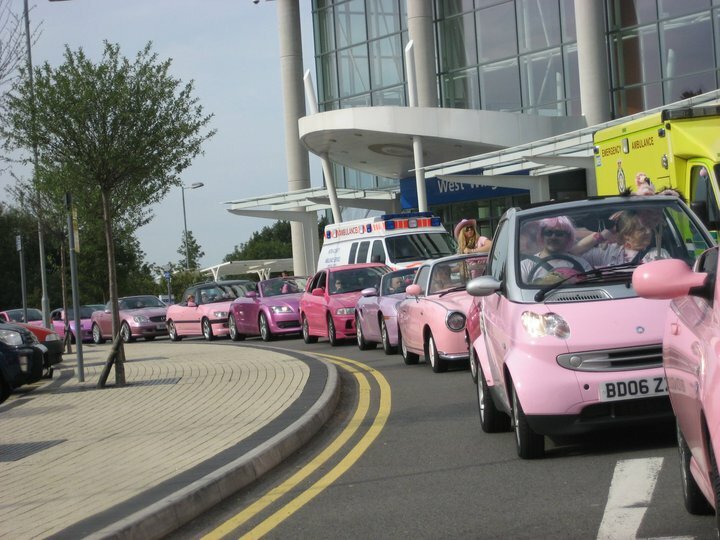 When Vanessa Chapman from the Pink Car Rally asked us to contact all our Pink Figaro Register Members we were only to pleased to help with this worthwhile cause. Thanks to Martin (Swindon) for mentioning this to us. 41bids finally selling for £15k on 23rd June. 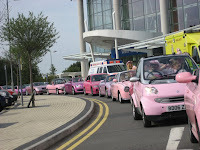 Sunday 5th September 2010 sees the third annual Pink Car Rally take place, in aid of The Little Princess Trust. If you have a pink Figaro, please consider coming and joining us for this amazing charity day out.The Little Princess Trust sources and pays for 'real hair' wigs for children who have lost their hair, primarily through cancer treatment. Sue has asked us to post this message. If you want to meet up with Sue on the day we will pass on a message for you. Have you got your car plaque? Print off a car plaque to display in your car at Fig10 here: http://www.fig08.com/fig10.html (we will have some availble on the day but not enough for everyone). Mail Failures - Are you receiving our updates? Hi, just sent out an update to all people attending Fig10. Got the following back as unable to deliver. Do you need a new roof? http://www.figaros4sale.co.uk/ Jason will be repeating the very popular free roof fitting prize again at Fig10. Enter on the day - £1 donation to our charity. We will draw the winner for this great prize at lunch time then Jason will fit a new roof to the winners car completely from scratch. So if you are thinking of buying a kit and doing it yourself watch it being done. WE PREVIOUSLY MENTIONED AN OFFER OF HAVING A NEW ROOF FITTED ON THE DAY BY BOOKING IN ADVANCE WITH JASON. HOWEVER ALL SLOTS FOR THIS HAVE NOW BEEN TAKEN UP. HE WILL BE FITTING CHROME TRIM ON THE DAY - SEE PIC FAR RIGHT ABOVE - NO NEED TO BOOK IN ADVANCE. We have contacted the previous winners Maria & Dave (pictured) who said their roof looks as good as it did the day it was fitted. We have got the go-ahead for a 30 mile Car Tour around Gaydon taking in old Warwickshire Villages, Towers/Windmills and great views following part of the Edghill WCC Shakespeare Country Leisure Drive Routes. We also guarantee you will pass Figaros on route. The run will start at approx 14:00 and you should be back within one hour unless you are tempted to stop to explore. We have been asked to limit the numbers of cars so please book a place when you arrive. Easy to follow route instructions will be provided. One of our earliest members has just bought a Topaz Mist Figaro and is therefore selling his S-Cargo. See below. 1991 Nissan S Cargo, 136 000km, full service and import history. Full stainless exhaust, recent undersealing and rust treatment. Alloy wheels, good tyres. Rarer porthole version with rear folding seat and 5 year old acrylic canvas roof. New radiator, recent cam belt change, new head gasket, water pump and front shock absorbers. Taxed and MOT. CD autochanger, though the head unit amp is not working. Very clean and well looked after example. Needs a good home for someone with soul and a taste for the unusual. Eddie of Sands Photography http://www.sandsimaging.com/ will be covering the event and on the day you can purchase a 7x5 Colour Print of your pride and joy on gallery paper in a slip folder for £8. There are other mount options available. We arranged for a local owner, Rosemary from Banbury, to visit the Heritage Centre where Fig10 will be held for a "photoshoot" in order for Eddie to have a Figaro sample for his stand. Here is one of the pics he took complete with pink furry dice. Thanks Rosemary. Fig10 -Sunday 16th May - 7 weeks to go!! Fancy meeting up the night before in Stratford-Upon-Avon? Then read on and book now. Great position on the banks of the Avon opposite the almost finished re-built Shakespeare Theatre. Plenty of parking around the Ripple Cafe at the Recreational Ground. £3 charge after 18:00 which can be redeemed from the Ripple if you have a meal there. We will try and park all the Figaros and other Pike cars together. You do not have to eat there. Park and meet up between 18:00 & 19:00, have a drink in the Ripple Bar then walk into the town. For those eating there at please book asap for 19:00. (you will be out by 21:00 when there is a second sitting) Please ring the Ripple on 01789 292121 and make a reservation in your name for the 15th May mentioning you are with the "Figaro Club". We have arranged this with the Ripple's Patrick. Please let us know as well if you have booked so we can look out for you and arrange that we sit together. 9 miles from Warwick, 12 miles from Warwick M40 services, 15 miles from Fig10. Sounds great - hope you can make it - we have almost 200 cars booked for Fig10 with 7 weeks to go. This was a great surprise for my birthday. AND it tasted good. Unfortunately it did not last long though with 5 adults and 3 hungry children around. Made by an old school friend of Laura to order. Owner Jenny from Liverpool is planning on attending Fig10 in her Boden Fig. I have been trying to track it down since it was given away as a prize by Boden in 2008. The Boden company started in 1991. Thanks to Kevin of the Figaro Owners Club for passing on a message to Jenny. The image above if from the original flyer promoting the competition. We will have a limited number of our original design Fig10 posters for sale at Fig10 and hopefully postcards as well. 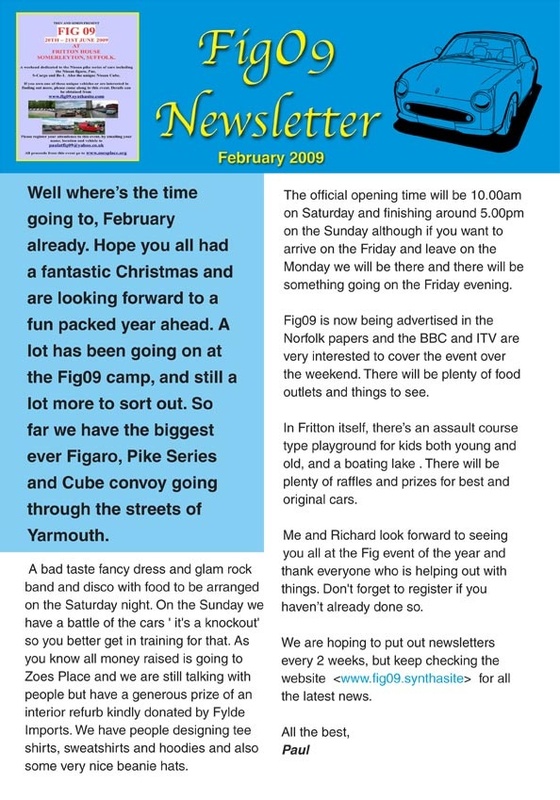 Yes we started registering owners for the Fig08 event in November 2007 which then became The Figaro Register which now has 626 members. This is made up of 601 Figs, 14 PAOs, 2 Be-1s, 7 and S-Cargos. 2 non Pike members a Nissan based Viewt and a Nissan Rasheen. UK owners 592 and International 34. Colours in order of popularity are Lapis Grey 187, Emerald Green 146, Pale Aqua 117, Topaz Mist 59, Pink 21 and other colours 71. Highest Region Density is the South East which includes London (52) with 166 Owners. Second is West Mids with 91. Highest Area/County Warwickshire with 26 owners and next Essex and Kent with 24 each. Nissan Viewt - The Other Pike Car - a Jag? Mrs Ross, Jane Goldman, has her snow covered Emerald Green Figaro well placed to appear in most of this 53 sec video clip of her husband serving up mugs of tea to the press pack. We bet you all have a good pic of your Figaro in the snow? Here is Laura's. Please send yours in to Fig_08@yahoo.co.uk and we will add it to this news item. I have negotiated a 10% Discount for the 'club members' if they take their Fig to JRC. Joe from JRC shows the prices for imported cars on the site. Tell members it is a must to have their Figs done because they are not generally treated properly in Japan to live over here. Joe says "I'm happy to do this because as a general rule - people who are active members of owners clubs take a lot of pride in their cars meaning they are usually in pretty good condition and hopefully therefore, in a nice state to work on." Additional info from MrFig08 -JRC is close to Doncaster and the price according to the website would be £255 -10%. I have checked this by phone with Joe who sounds very helpful. Just spotted by MrsFig08 on the BBC News Site "Snowfall delays Christmas getaway" a picture of a green Fig taken in snowy traffic in Wandsworth. Number possibly ends in MLJ. Jason from http://www.figaros4sale.co.uk/ will be repeating the very popular free roof fitting prize again. Enter on arrival at Fig10 for the draw at 12:00. This gives time for it to be fitted. Pic shows Fig08 winner after fitting of this great prize. Clarion Services www.clarion-service.co.uk/figaro.asp. Donated raffle prize: one full refurbishment of a Figaro Stereo/CD Player. This prize is worth up to £350.00! Celebrate your Figaro's Birthday - Find out the date your Figaro was built! We are offering this service to owners who have Registered for Fig10 where we are having a competition to find the oldest and youngest Figaro and perhaps find a Figaro with a birthday on the Day! Register for Fig10 to find out more. So far we have had 24 owners enter and the oldest Figaro so far was built on 20th February 1991. Over 100 cars registered to attend Fig10 so far! 106 To be exact. Register to attend here or read more about the event here. I hesitate to use the words tea-towel to describe this lovely Fabric Figaro Print especially commissioned by Julia of Figgy Pudding for Fig08 last year. I chanced to discover she still has a few left when discussing Fig10 with her. You could use it as a poster or cover a cushion with it to go in your Fig. 100% Cotton. Made in the UK. Aqua and Green available at the reduced price of £7.50 which includes p&p and a £1 donation towards this years Children in Need. To order one contact Julia by email juliajepps@yahoo.co.uk You can pay by paypal using this email address but contact her first. The latest Total Nissan is out (issue 10) and Register member Isobel from Glenrothes gets a mention and her Figaro is on two pictures featuring all the Nissan Import models catered for by the mag. One shows the Fig on the circuit keeping up with her big brothers! The Register gets a mention as well but as usual they get our name wrong. This time it is the Fig 08 Club! Interesting - quite like it. There is a prize to be awarded for the best car. A trip to Poland for the Maciej Polody Drift Academy. What's that then? Laura has just switched to an Agreed Value Classic Car policy (to see why read our news story "Insurance stories" in May) with Classic Line Insurance following a recommendation from a Figaro Owner. We were quite pleased with the price. This prompted me to contact my Classic Cars Insurance company - Peter Best Insurance Services - and they too have Figaros with agreed values on their books all with limited mileage polices typically below 3000 miles. Check your MOTs to see how many miles you have done per year. Hopefully 3000 is enough for local use and a run to Fig10 in May 2010! QUOTE THE FIGARO OWNERS REGISTER WHEN ASKED IF YOU BELONG TO A CLUB AND YOUR REGISTER NUMBER AS YOUR MEMBERSHIP NUMBER as this is sometimes a requirement of classic insurance. Apparently, the S-Cargo radiator is unique and cannot be easily changed for other than an original part. Mine started leaking and despite dosings of 'Bar Leaks' or whatever had obviously given up the ghost, spltting along the top (plastic) seam..
Enquiries through Nissan and other specialist Pike traders revealed that a new radiator would be £700 or so! One company suggested having one made, so I trawled through the local Yellow pages and found a company that would make one for me. I took the old one out: pretty easy for an engineering type and delivered it to a chap who in turn took it to the company where he works. One day later, he'd fitted a new core (the middle bit with all the holes), re-used the lower manifold and furnished a complete new soldered brass top. The radiator came back cleaned and sprayed ready for re-fitting. £150 including VAT. Quite a price but a big saving over the original and the chap reckoned his was a better radiator with improved cooling properties. I fitted it yesterday and it all looks good. Contact me through David if you have the same problem. 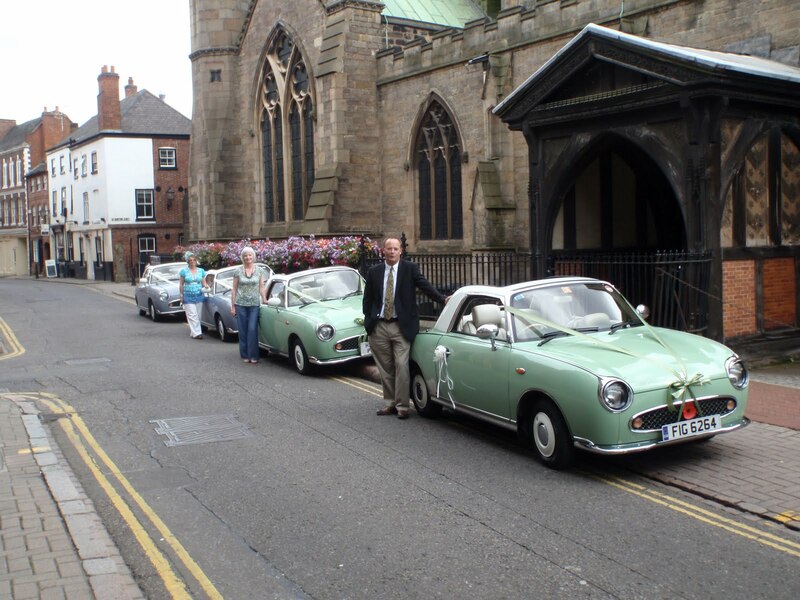 If you use Twitter and want to follow Fig10 and other Figaro related news via Twitter please follow us here: https://twitter.com/nissanfigaro. Most tweets will come from our news blog so don't worry if you don't use Twitter you can still keep up with news via our webiste. Not getting our Regular emails?? The emails for the Register Members below are coming back as mail failures. We have no other way of getting intouch with them. Can anyone help? Does anyone know these owners? To all Figaro Owners Register Members in the South West. This is a sample of the latest feedback on eBay regarding the stickers. We still have some left! You do not have to purchase via eBay - just email us for alternative method using stamps. - Great seller. Many thanks. Looks great on my emerald green! - great thanks, arrived quickly ,now my tax disc wont keep falling off !!!!!! Knockhill Racing Circuit Streetcar Scotland Show. The Register have been invited to Streetcar Scotland by Total Car Magazines. We have emailed our Scottish and most Northern members with the info. See below. Please see the message below regarding Streetcar Scotland, on 23rd August at Knockhill, and photo-shoot. I cannot attend but I could co-ordinate the entry using the attached form. Each individual could send their entry fee direct to the organisers? £8 per person - refundable if you are used in the shoot. I'll have to check this out with the organisers - if there is interest from our members. Please let me know if you want to attend as a "club". Sounds great. Perhaps not the Figaro scene - superfast Japanese Cars and other early Japanese "classics" - but an opportunity to meet other Figaros and show off our cars AND with luck get your picture in the Mag. Lesley Steel from Total Car Magazines here, publishers of Total Evolution, Total Impreza and Total Nissan. I am hoping you can put a message on the forum or perhaps email your members. You may know that we are working closely with Knockhill Racing Circuit in Scotland on a show being held on 23rd August – Streetcar Scotland. The shows brings a large Jap influence and as the show is now being produced in association with our magazines we want very much to increase this. ONE HUGE PHOTOSHOOT – THREE PARTS - IN ONE HOUR!!!!!!! We have the track for one hour to get one model of every Nissan, Evolution and Impreza on the track to perform 3 separate photoshoots for the magazine. We are looking for the best of every model to be put forward for this and to attend on the day for the shoot (and of course the rest of the show). We have a dedicated paddock & parking area for anyone taking part in the photoshoot. Anyone taking part in the shoot will have their entry fee refunded on the day. This shoot will appear in the magazines with a major feature. The best Evo, Nissan and Impreza on the day (as judged by Knockhill) will win a front cover photo shoot in the respective magazine!!!!!!! As in flares and not trousers or wheel arches. I don't know if the other Pile cars have them (or the Skyline for that matter), but my S-Cargo has a flare tucked under the left hand dashboard. I've had this translated, which whilst not perferct English, is better than my Japanese. Hopefully it will bring some insight and amusement to others. In December 08 the Figaro Owners Register was asked by the Deputy Editor of Classic Car Weekly to find a Figaro Owner close to Peterborough who would allow their Figaro to be used in a photo-shoot for the forthcoming Figaro Buyers Guide. We contacted "Amber - Peterborough" who jumped at the chance and was very pleased with the results as seen in a January issue. We have now been given permission to show the article on our site. Thanks Ian. Access the Figaro Buyers Guide here. We have chosen the eBay route because it simplifies payment and may create more interest. They are self-cling vinyl and can be used as tax disc holders. We are hoping people will put them on their cars to attract new members and more waves! As always any profit will go to charity. As an alternative we will accept stamps as payment (6 x first class) if sent with a return stamped addressed envelope. Please email for address. § Fab thank you - looks great! § Top Ebayer quick shipping!!! Great sticker!!! § great thanks, arrived quickly ,now my tax disc wont keep falling off !!!!!! § Great seller. Many thanks. Looks great on my emerald green! § Excellent and thank you SO much for the brilliant card it came in! Figtastic!!! Insurance Stories - Body Work Repairs - "oh yes" - write off ? Unfortunately Laura's Fig received damage to the rear wing and rear bumpers. She was able to carry on using the car and reported it to her insurers who asked her to take it to the Repair Shop they used. Of course they had never dealt with a Figaro before and a lengthy saga then began of calls to a call centre. Different operators each time and different reasons for delays including one alarming statement that they may write the car off! When would we get an "OH - YES"? In the meantime Jason from Figaros4sale gave a reasonable quote. Eventually they offered a sum which almost covered this. Not sure why they suddenly decided to do this? They of course were trying to price up a new wing which is impossible. Whereas Jason has the expertise to repair it which he has now done - looks better than ever now. Hopefully there will not be a next time but we may switch to an agreed value policy and enquire what the repair procedure is. Another Register member had her Figaro "written off" on her first journey. The insurers declared it a "write off". She got the full price back and has bought another one AND bought back the "damaged" one which she will get repaired by a Figaro Specialist at a later date. In another case a local owner had his written off when the repair bill reached £8k but did not buy it back. Initial research on the internet reveals there are different catergories of "write off". The catergory with the least damage allows you to get the car repaired but then is subject to an inspection and MOT. I would guess that because of the lack of new replacement parts Figaros would usually fall into this catergory. We sold 15 stickers during March and as promised we have donated 50p per sticker to Red Nose Day. Thanks to everybody who bought one. Got yours yet! Michael from Dallas Texas. His Figaro Story. We have included some Members "Figaro Stories" from abroad in the news section. Hope you find them interesting - we did! You do not have to own a Figaro to take advantage of the Figaro Owners Register services. We can put you in touch with owners local to you AND by registering you will receive our regular updates on Figaro news and events. Figaros in Vienna - International Figaro Owners Register! I´m a collector of oldtimer-bikes and scooters and 3 years ago, while finishing may last project, a Heinkel Tourist 103A2 built 1963 I thought about my first oldtimer with 4 wheels, but I was a little bit afraid to restore a car, because it´s a lot more difficult to do dis than a bike.. Jürgen, a good friend of mine, joked about this and told me about the Figaro, a oldtimer-designed car, reminding of the Gutbrod Superior of the 50ies with common and modern technology of the Nissan Micra. This should be the right thing for me! Investigations in the internet, especially pictures let me fall in love with this nice little car, and further investigations let me meet 2 owners of Figaros in Vienna/Austria (www.nissan-figaro.com), who are also in the business of car requisites for movie-productions. I talked a while with thiese guis, they let me drive a while with the Figaro trying the inner dimensions (I´m tall) and then the decision was clear: I want a Figaro! During the next 2 years I banged around in the internet, collected a lot of information, checked import options from japan, USA and Great Britain and found last October a fair and reliable offer on ebay in London by a private seller. in a longer e-mail-correspondence with the seller I got the trustworthiness, did my bid and won the auction, a week later I travelled with my wife from Vienna to London, saw the car, was absolutely not disappointed and finished the bargain. Then I programmed my mobile GPS with "Home" and the transfer by own wheels to Vienna began. 3 days and 1.560 km later we arrived without any incident a little bit tired, but happy in Vienna and had immediately a stop-and-search operation: the reason was not a delict, no, it was the curiousity of the policemen! They never had seen such a car. Meanwhile I had to invest a new battery and 4 new tyres, they were used up and now (March 2009) the weather is so fair, that we are able to drive a little bit on weekends around Vienna to learn more about the Figaro and on the end of April 2009 we will enter the Seiberer Mountain Race in Austria, a constancy competition for oldtimers (www.seiberer.at). Driving the Figaro is easy, funny and we enjoy the large opened eyes and opened mouthes of the other road users, we are often asked about details of the car and we have always a printed leaflet about the Figaro (information on the german issue of wikipedia) in the glove box. With the Figaro on the road you will be ever asked about the car. For a regular registration in Austria the car the headlight has to be converted, this is at this thime the biggest problem, because it isvery hard to find the proper headlights for our inverse driving side; maybe one of the registered owner has a clue for us? The Figaro will be our fun-car for summer, except we drive our bikes or scooters; 1955 Puch RL 125, 1963 Heinkel Tourist, 1985 KTM Hobby, 1998 Honda Pantheon, 2000 Yamaha XJ 900 S Diversion (and maybe soon 1953 Vespa Faro Basso). By the way: my other car is a Opel Astra Caravan. Well, I hope to gave you a little bit background about my ownership of the in Austria absolutely rare Figaro and I hope also to realise to meet the Figaro10 next year! Figaro Owners Register members by region as of March 2009. Scotland 14. North East 10. North West 47. Yorkshire 32. East Mids 34. West Mids 68. Wales 11. East Anglia 46. South East 86. London 44. South West 44. Northern Ireland 4. Ireland 1. Jersey 1. France 2. Germany 1. Norway 1. USA 1. Pakistan 1. Canada 2. Hol1and 2. In addition to this we can break it down by County. Figaro Owners Register goes International! If you have not received it please let us know OR if you would like these regular updates please Register with us. We are a non- profit Daughter and Dad team who enjoy running the Register which came about after the successful Fig08 and are starting to think about Fig10!!! My group, Figaro Owners , is fundraising for Red Nose Day. You'll be able to create your own Red Nose day Giving page and add whatever you raise to the group's grand total. If you've already been snapped up by someone else, or you just don't fancy joining us, maybe you'll click on the link above and sponsor us instead! Nissan Figaro Northern Ireland Meet May09? We are posting this news item for Alan who is organising another NI meet. He can be contacted via the link below or if you send an email to us we will forward it on. Figaros in Canada - International Figaro Owners Register! I came across my Figaro by accident. I like to think it was meant to be. On the day I was looking for a car to buy I had posted something to that effect as my status on facebook. I then proceeded to look through the local Craigslist listings. I was pretty much looking for something cheap and reliable. I had seen a Nissan Figaro but didn't know what it was so I bypassed it. (There is an overwhelming amount of used cars for sale in Vancouver). When I went back to check my facebook my friend, Lauren, who is on an art exchange in Ireland at the moment had commented that I should by a Figaro (apparently her roommate in Ireland has one). I thought "I wonder what that is...I just saw a listing...". So I went back and clicked on the ad and it was love at first sight. What are the chances that a Figaro would be posted on the exact same day I was looking and that my friend in Ireland (who had only been there a couple of weeks) would suggest it?! I was sellling my 2007 BMW 323i to raise some cash towards opening a yarn shop. The discovery of the Figaro made giving up the BMW so easy. Actually, I am way more excited about the Figaro than I ever was about the BMW!! All I keep saying is that it is "so darn cute"! Everyone I know says that the car is "so me" and that it is "so cute". Even my Mother who tried really hard to say it was just a car admitted it was cute. And of course, there aren't many in Vancouver so we get a lot of stares and curious questions. I have owned the car since January 23, 2009. I bought it from a fellow who imported it from Japan. His wife is Japanese and I think he lived there for a time, too. He now has a second Emerald Green Figaro he recently imported that he plans to love. It is very apparent from talking to him that he absolutely loves Figs, too. P.S. I used to own a 1971 VW Karmann Ghia some years back. That was a cute car, too but not nearly in the great shape the Fig is in or nearly as cute! Princess Eugenie - proud owner of a Nissan Figaro. Although Mandrake takes the view that the best drivers always require several attempts to pass their test, Princess Eugenie, the 18-year-old daughter of the Duke of York, can now throw away the L-plates attached to her Nissan Figaro after sailing through her first practical. 1996 Mitsuoka Viewt 1.3 auto. Built from the K11 series Nissan Micra, which basically consists of restyling the front and rear ends to resemble a Jaguar Mk.2 complete with chunky chrome bumpers. The interior on my car is more or less standard micra, but some have leather trim and/or wood effect dashboard. My car does have electric front windows and aircon though. It has currently done 85,000 km (just over 50,000 miles) and I am the second owner since it was imported into the UK. I have owned it since August 2007. I use it as my everyday car and it is always attracting attention, people either love it or hate it! There are not that many around, I have seen 3 others in the past 3 years, but there are quite often one or two advertised on autotrader and ebay. There is a company called Mitsuoka UK who specialises in importing them, but I bought mine from a Japanese car importer locally in Stockport. Figaro Owners Register member Amber’s Emerald Green Fig is featured in this weekly paper. The deputy editor contacted the Register requesting a Figaro to use in the article based locally in Peterborough. This is the website although it still shows last week edition - I have pointed this out to them. David & Laura – Figaro Owners Register. We have chosen the eBay route because it simplifies payment and may create more interest. As always all profit will go to charity. We have chosen this route because it simplifies payment and may create more interest. They are self-cling vinyl and can be used as tax disc holders. We are hoping people will put them on their cars to attract new members and more waves! As always all profit will go to charity. DID YOU GET YOUR COPY FEATURING the Figaro event of the year FIG08? If not now is your chance at only £2 a copy. Go to the link below and the one you want is Total Nissan Issue 3 Summer 2008. This is an email I received. I have attached a list of numbers we have for sale but would like to draw your attention to the following in particular, as I feel they might be of interest to you or you club members. Please telephone 02866329911 for further details. However, if you are in the Swindon area, there is a proper, independent automotive engineer in the form of Dave Daltrey at the Old Forge, Wanborough, 01793 790315. Over the past 20 years, Dave has worked on many different types of car and will adapt and even make bits on his lathe (for my water pump for example) if needed. He also just loves Nissans! So if you are stuck, give him a ring: you might even see my S-Cargo up there! Martin Ripley Coffee S-Cargo 'B asil', Wanborough, near Swindon. I run a company called Northallerton Engineering Services/2cv speed shop, www.2cv-speed-shop.co.uk / www.northallerton-engineering-services.co.uk (the speed shop one is going to be re designed as we speak). We build and restore 2cvs from road to race, I am also starting to offer a service for the s cargo and citroen h van. The Pike cars are of interest due to the links with citroen, (s-cargo with the 2cv van and figaro with the bijou) through design, as an s cargo owner I am looking at links for parts supply as the s cargo seems to be forgotten brother of the figaro. Nissan Figaro Numbers in the UK???? This is a popular subject and one that has never been resolved to our knowledge. A forum member contacted the SMMT who quoted a figure of 951 based on DVLA information for year end 2006. Various forum members then checked their V5 only to find they were only recorded as "Nissan". You can get this updated by sending the "changed details" to DVLA with a covering letter. So to get an accurate figure every owner would have to do this but how would you manage this! GJNORTHALL suggested the alternative would be to ask the DVLA to search the number of cars with a VIN number beginning FK10 but no-one has attempted this yet as far as we know. The consensus on the Forum seems to be that around 2000 are in the UK now. We have 359 registered on the site now. The most recent registrations coming from owners finding us by chance on the internet or as a result being given a flyer - which you can download from the site. FYI and for the other registered/non registered S-Cargo owners, something came up on my Professional institution forum today regarding vans and speed limits. It appears that though the s-cargo has a body type of 'Van' and is 'Private Light Goods', it counts as a goods vehicle not exceeding 7.5 tonnes for speed limits purposes. This means that on 60 mph restricted roads, the limit would be 50 and on dual carriageways, the limit would be 60. The only exceptions to this are where a van is built on the same chassis as a car variant and has a gross weigh less than 2 Tonnes. S-Cargos are NOT based on the chassis from a saloon equivalent and therefore are outside of this exception. I don't know how many people know this, and it would probably only apply if one was exceeding the written limits by sufficient margin, but it might avoid some speeding fines out there! website- www.fig09.synthasite.comto register- paulatfig09@yahoo.co.ukand finally the flyers - http://idisk.mac.com/applegaffer-Public/FIG09a.pdf http://idisk.mac.com/applegaffer-Public/FIG09a.jpg Message from Paul: thanks for helping us to promote this - we're getting loads of interest and the bbc and itv local channels want to do a bit on it as well. all the best. Lauraar and I are taking a rest after the high of Fig08 but Scooby1965 and Trev from the Forum are planning a Fig09 event in Suffolk. The other forum members who helped out so well at Fig08 have already agreed to help. 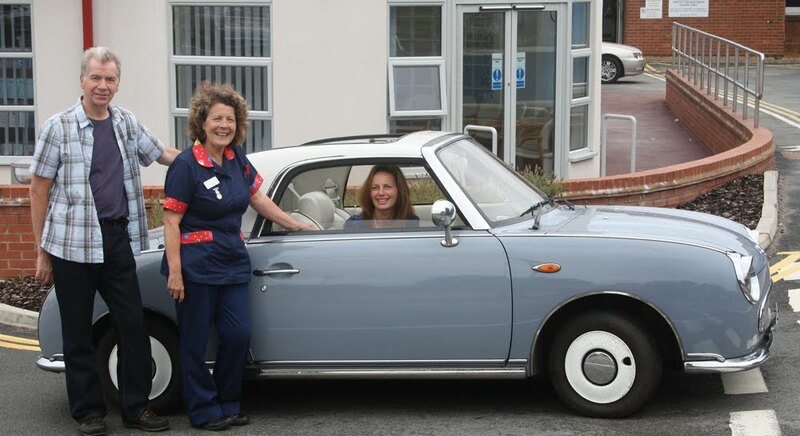 Hello, my name is Sue and I am a Lapis Grey Nissan Figaro owner in Swindon. My husband Kev and I have met some lovely people and their cars at various events since we joined the fantastic Figaro few. We saw that you had registered on the Fig08 website and so have asked the organisers to forward this message to you on our behalf. We would like you to join us and have some fun, so come and enjoy a ‘Fig-Nic’ at Lydiard Country Park Swindon Wiltshire on Sunday 7th September from 11:00 am. Apart from the beautiful Country Park with outstanding walks and views we will provide a Picnic at a small charge of £3 per person, a quiz and easy peasy Treasure Hunt with prizes. There will also be a chance to win a brand new Mercedes-Benz C-Class or SLK-Class for £1 sponsored by Mercedes-Benz of Swindon in aid of the Prospect Hospice. All you will need to bring is something to sit on; i.e. Blanket or Chairs and perhaps a Teddy for tradition and we will do the rest. Visit www.autosupplyuk.com/forums/viewtopic.php?t=6041 for details and registration. As you will see from the news item below there is a great article on Fig08 in the current Total Nissan Magazine. We just spoke to Total Nissan and it went on sale 3 days ago in 1800 outlets across the country! WH Smith and Borders Bookshops but NOT ALL BRANCHES of either. Also quite a few Post Offices and Newsagents. Fig08 Update and Total Nissan Magazine article! After the success of Fig08, as the article suggests, we have turned the Fig08 website into register for Figaro owners and reached the 300 mark recently. I've just uploaded a flyer (available via the Homepage) which we have been using to stick under Figaro windscreens, we would be really grateful if you could print some off and keep them with you for when you spot a Figaro. We'll also make some cute window stickers available soon for registered Figaros. Fig08 was the first national gathering for Nissan Figaro owners at the Heritage Motor Centre (HMC) museum at Gaydon, Warwickshire on Sunday May 18th 2008. Total cars that attended: 208 plus 3 Paos, 1 S-Cargo, 1 Be-1 and 1 Rasheen. Total raised so far for the Wheels Project £1,100, www.wheelsproject.org.uk. Which was fantastic for the first event organised and promoted via the Internet. Most of the money was raised by the sale of raffle tickets – well done the Forum Team. What generous people Figaro owners and Figaro Traders are. "Car of the Event" was won by Madeline Wilson in the lovely pink Figaro and trailer. Second, by one, vote was FIG4454,Nic & Alison with a fireglow red pearl figaro from Wimbledon. Furthest Traveled Figaro went to Katrina & John, 328 Miles. We realised later that Amanda from Aberdeenshire was at the show, 458 miles. They both deserve a prize for this feat and both received a subscription to Total Nissan Magazine and a Fig08 certificate. Maria & Dave McSweeney won the free roof fitting. We have had a lovely thank you email from them. They were so pleased to win it - Jason who offered the prize from www.figaros4sale.co.uk worked really hard all day - a star. Maria & Dave have made a separate donation to the Fig08 nominated charity as have Hallen Import Specialists. Ian from Stratford won the www.fyldeimports.com £500 interior upgrades. We sold out of Fig08 posters but we are having some more produced. If you would like one, £5 incl p&p, please email David at david@fig08.co.uk. Figgy Pudding has a number of Tea Towels left. To obtain one please contact Julia. juliajepps@yahoo.co.uk. Even Northern Ireland got in on the act and raised 3 figs on the day. Thanks again to the traders and Forum Team. A special thanks also to our non-fig friends for helping out on the day:- Patrick & Sandra, Tom, Derek and Roz, Andrew, Debbie & Lucy (the pencil princess) Nick and Alex. Sam (Mr Figo8's son) on the car park and Eve (MrsFig08) on the register desk. A marriage of Figaros - was chosen at Fig08 as the collective noun for Figaros. Lots of news today! See you in 4 days, Laura and David. I've created a print version of the programme and the car plaque to place on your windscreen for you to print off and bring along to Fig08. We’d love you to share your photos from Fig08 with us. Flickr is a photo-sharing website and we have setup a group especially for your photos of Fig08. For more information, (including some instructions) visit the Photos section or go straight to the Flickr group: www.flickr.com/groups/fig08. One photo will be chosen from the Flickr group and will be published in a special article by Andrew Noakes (www.andrewnoakes.com) about Fig08 in the next issue of Total Nissan magazine. The photo will be picked by Total Nissan magazine on the 18th June and will be the one they think best captures the spirit of the event. We will announce the winner on the Fig08 website. Good luck! Money made will cover our printing costs for the event and will go to the Fig08 charity. Thank you to Bob Platt from Hand In Glove for designing this for us. As well as interior upgrades, parking sticks and a new roof , Clarion Service UK -are unable to attend but have very kindly donated this great prize: one full refurbishment of a Figaro Stereo to one of our models 580USB. This prize is worth £400.00! See the website for more details: www.clarion-service.co.uk/figaro.asp. See the Event page for a full list of prizes. We have setup a Flickr group to allow you to share your photos of Fig08, please see the new photos section for more details, currently it includes the official Fig08 poster that will be available at Fig08. Also thanks to Sarah (Soupsake) for her help with this. Julia Jepps of Figgy Pudding, purveyors of fun stuff for Figaro fans, is bringing along a specially commissioned Figaro tea towel, designed by Jam Tart of Stratford on Avon. The tea towels are 100% cotton, designed and made in the UK. Two colours will be available, blue and green, as close as possible to the Figaro original colours. Great gift items and practical too, they will be on sale to Fig08 attendees at £7.99, the special show price. 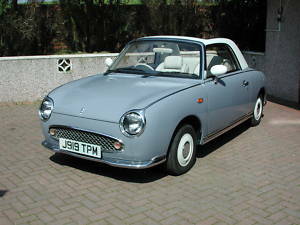 The Figaro image features a Fig08 number plate, so a unique memento of what should be a special day for all Figaro fans. We made it to 200 booked - how may turn up remains to be seen but wow. The donated prizes must be worth over £1000 with Marc Harkins giving a £200 voucher to spend with him at Figaroclub.com. It has occurred to us now that the prize giving and raffle will be the top item on the day. Thanks to attendee Sayuri for posting on one of the Japanese Figaro fan sites: http://www.21style.jp/bbs/figafiga/ (if you can't find the posting search the page for fig08). The postings that follow are saying that the event is a testament to the Brit's love of the Figaro, that they are impressed with the event and wish us good luck! Total Nissan Magazine - www.totalcarmagazines.co.uk/indexTotalNissan.htm have kindly donated 3 yearly subscriptions donated which will be a prize on the day (details to follow). The 2nd edition of the new magazine includes a spread on the Nissan Figaro! Fig08 T-shirts - order yours now! Official FIG 08 T-shirts can now be ordered in advance of the event and are priced at £10.95. For each shirt sold £1.00 will be donated to the Fig08 designated charity. www.wheelsproject.org.uk .Thanks to chrisfiggynut for coming up with these. Due to the production costs and uniqueness of the Event there will not be any for sale on the day although the standard "inkstyles" Figaro T-Shirts will be available. Additional colours may be available by special request for the same price. Please note that the t-shirt will not match exactly the figaro colours. If you wish to order, please contact inkstyles@hotmail.com stating size and colour of T-shirt and a confirmation will be sent, along with the address to post cheques or postal orders. Paypal is also an accepted method of payment. chrisfiggynut will bring the ordered (and paid for) t-shirts to the event or if anybody requires postage beforehand please state when placing order with inkstyles. P&P is extra. We have reached 150 Figaros!!!!!! To help us get up to the 200 mark please print off the flyers (available on the homepage) and flyer any Figaros that you know of in your area. Have you seen the fantastic new prize donated by www.fyldeimports.com, check out 'The Event' page to find out more! We now have a gang from the Figaro forum organising some fun stuff on the day - check out 'The Event' page to find out more. Also thanks so far to everyone who has got involved in the day, we really appreciate your help in making this a fantastic day! Thanks to Lisanne (Forum name Barbarella) for setting up a Facebook event page, people can join here but still need to register via this site to attend on the day. Please visit the site regularly to keep up with the latest news and to download the flyers!! We are starting to get a few people who said they found out about the event from "internet search". If you can add a link to the Fig08 site from any sites you run this will move us up the list when a search "Nissan Figaro" is done (I am reliably informed). Currently we are at the bottom of page 2 on Google. Yes we have reached 100 plus the 4 Paos, 1 S-Cargo, 1 Be-1 and a Rasheen. Top colour is Lapis Grey 27, Emerald Green 24, Pale Aqua 22 and Topaz Mist 12. Top of the other colours is Pink with 5 cars. This website was created by laura@fig08.co.uk last updated 26th June 2008.